"Spring into savings and GO to the Zoo for a great BOGO offer! This weekend at Tampa’s Lowry Park Zoo, buy one admission, get one admission FREE of equal or lesser value with coupon printed in the Friday editions of the Tampa Tribune and St. Petersburg Times. Bring your whole herd and save some green! Offer valid for daytime admission on Saturday, March 21 and Sunday, March 22 only. One free ticket per coupon redeemed; must be presented at the time of purchase. Not combinable with any other discounts or offers. 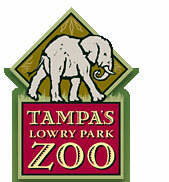 The zoo is located at 1101 W. Sligh Avenue in Tampa, one mile west of I-275 (exit 48). The Zoo is open seven days a week, from 9:30 a.m. to 5 p.m. Regular admission prices are: adult - $18.95; seniors (60+) - $17.95; children ages 3-11 - $14.50, and children 2 and under - FREE. Parking is free. Visit LowryParkZoo.com or call (813) 935-8552 for more information"
Make sure you get out and enjoy the weekend!